Thirty black-and-white and color reproductions bound in a handy postcard collection. Published with the Museum of the City of New York. 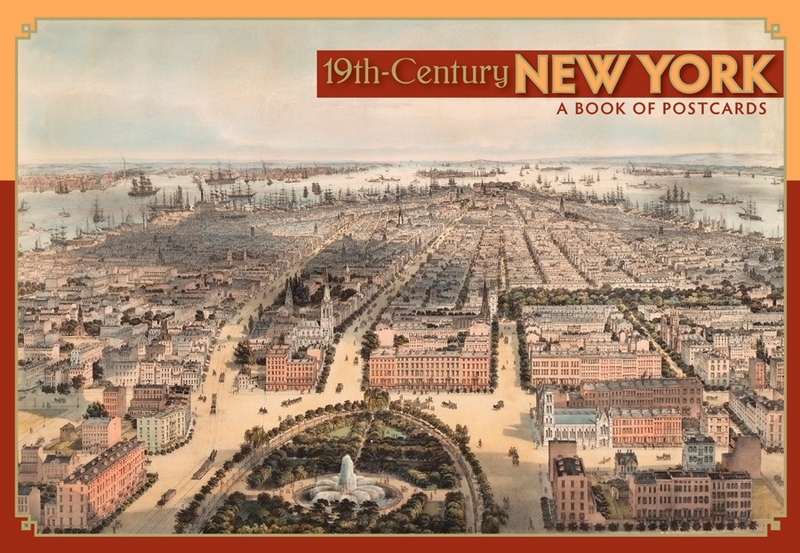 The nineteenth century was a time of dramatic change for New York City, setting the stage for its transformation into a world center of commerce, culture, art, education, and entertainment. Rapid development of the city’s infrastructure, the opening of the Erie Canal, the creation of Central Park, and a great influx of immigrants were among the many factors that fueled its growth. The thirty fascinating images in this book of postcards document the city’s life and expansion during the nineteenth century. All are from the collections of the Museum of the City of New York, and from New York 400: A Visual History of America’s Greatest City, with Images from the Museum of the City of New York, by John Thorn (Philadelphia: Running Press, 2009). The Museum of the City of New York’s vast resources—numbering more than 1.5 million objects and images—explore the city’s past, present, and future through the museum’s extensive collections of photography, prints, and drawings; paintings and sculptures; decorative arts and furniture; theater and Broadway materials and memorabilia; toys; and fashion, costumes, and textiles. A wide range of exhibitions, public programs, and publications explore and celebrate what makes New York City the vibrant and dynamic city that it is.